Campaign looks back at some memorable ads Bartle Bogle Hegarty created during its seven-year relationship with Virgin Media. 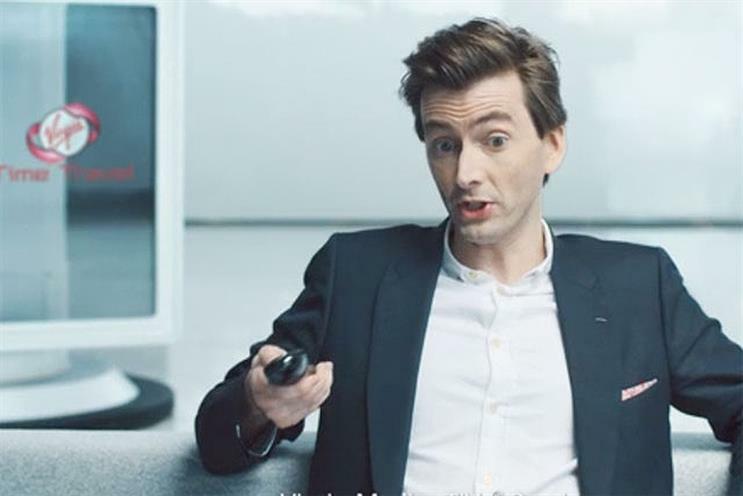 The first ad created by BBH for Virgin Media stars former Doctor Who actor David Tennant – who searches for films starring himself using the brand’s TiVo service – and Virgin’s founder, Sir Richard Branson, who looks noticeably younger after using a time-travelling machine. The spot was later pulled because the BBC complained about its reference to the sci-fi show. Next, the brand teamed up with footballer Peter Crouch to promote the availability of BT Sport on the platform. Voiced by Harry Redknapp, the strapline is: "Make sure you start the season with the right team." Multiple Olympic gold medallist Usain Bolt competes against Blot in a series of physical challenges, representing fibreoptic versus regular broadband. Branson also appears as a tea-sipping judge. Ed the sofa bear watches The Wolf of Wall Street as his flatmate tidies around him to promote Virgin Media’s Big Kahuna Movies Bundle packed with movies and box sets. Bolt plays himself, Mrs Bolt, Grandpa Bolt and baby Bolt in this ad. The funny spot shows the athlete watching his favourite team in the front room, while Mrs Bolt explains that she is watching her favourite athlete, Mo Farah. Virgin Media's faster broadband service, Vivid, keeps a house party alive and even helps a young couple get together in this spot. The TV ad was extended online with a 360-degree digital campaign, allowing users to virtually walk through the house party. What makes our Olympic superstars what they are? "9.58 seconds" reveals 10 interpretations of why Bolt is the fastest man on Earth, each lasting as long as his 100m record at 9.58 seconds. Bolt, Iron Lord Hunter from Activision game Destiny, Southampton FC and Donatello from Nickelodeon's Teenage Mutant Ninja Turtles race down a gigantic, futuristic fibre cable to get into viewers' homes and on to their screens. Bolt turns into Super Bolt for this animated ad in which actor, screenwriter and director Richard E Grant stars as an expert English tailor, who helps Bolt find the perfect superhero suit. Long-time brand ambassador Bolt transforms into a superhero again in the next chapter of these comic-like ads for Virgin Media. The entirely animated spot sees Super Bolt leaping into action to save an out-of-control train full of football fans with his super speed.